Ever tried to imagine what it would be like to be deaf or hard of hearing? Well even if you spent a whole day blocking your ears, deafness is unfortunately not something you can understand unless you’ve actually experienced it. 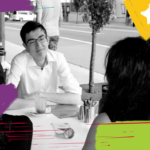 What most people don’t realise is that deafness affects a lot more than just your hearing – it can actually have an impact on everything from relationships and learning, to mental health. With Hearing Awareness Week recently wrapping up, we thought it was the perfect time to shed light on some surprising facts about what it’s actually like to be deaf or hard of hearing. Armed with these insights, we hope you can find better ways to overcome the hearing barrier – whether you’re deaf yourself, or talking to someone who is. 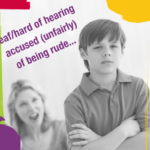 1: Deaf people are often (unfairly!) accused of being rude. irritated, take a moment to consider if the person you’re talking to may be deaf or hard of hearing. If this is the case, they may simply not have heard or understood you (and given how small hearing devices are these days, it’s not always easy to tell). The lesson to take away? Take care to communicate clearly, be patient, and don’t jump to conclusions! Really, this is a good approach to take when you’re dealing with anyone (we all deserve a second chance! ), but it’s especially important to remember when you’re interacting with someone who’s deaf. 2: Hearing is not the same as understanding. Deafness doesn’t just affect hearing – it has an impact on general communication skills too. This is largely because people who are deaf or hard of hearing have often had a lot less exposure to language and vocab throughout their lives. Make no mistake: this DOESN’T mean deaf people are stupid! It just means they have to work much harder to comprehend a conversation. With this in mind, never make someone feel bad if they ask you to repeat yourself, or don’t get the punchline of your joke. They may be hard of hearing (or your joke may just not be funny!). It’s important to remember you never know the lengths someone has to go to just to keep up with everyday chit chat. 3: Hearing overload and exhaustion is a real thing. right? Well, spare a thought for people who are deaf. For them, communication is ALWAYS hard work, even if they’re just at a party or ordering a coffee. Whether they’re frantically lip-reading, or straining to hear what’s being said, it’s flat out exhausting. So next time you’re around someone who’s deaf or hard of hearing, try to speak clearly (and don’t let people talk over the top of each other). It’s not a bad idea to ask if there’s anything you can do to make communicating easier for them too. And if the deaf person needs some alone or quiet time, don’t be offended! 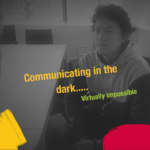 4: Communicating in the dark is basically impossible. When you think about it, there are plenty of times when there’s little or no light, and you have to rely purely on hearing to communicate (think camp fires, dance floors and cinemas). For most of us, this is no big deal – but if you’re deaf or hard of hearing, it’s another case entirely! Even with hearing devices like cochlear implants, many deaf people rely heavily on lip-reading. What does this mean for you? Well considering it’s basically impossible for deaf people to communicate with someone they can’t physically see, don’t forget to factor in lighting and visuals when you’re talking to them. Sometimes asking ‘can you see me?’ may be just as important as asking ‘can you hear me?’. 5: Deaf people are twice as likely to suffer from depression and anxiety. Life can be tough at the best of times, but when you factor in the challenges of being deaf, it’s even tougher. Deaf people can become isolated, cut-off and left- out very easily, especially when others don’t make enough effort to communicate. After all, communication is the core of most relationships – and we need those to live happy connected lives! Hearing Awareness Week reminds us to check in and make sure the deaf people around you are feeling included and OK. If you know someone with hearing difficulties, keep in mind how much tougher this can make everyday situations and put in some extra effort to reach out. 6: Deaf people often hide their hearing devices (and for good reason). Sadly, a lot of us assume that if someone is deaf, it’ll be obvious – they’ll be wearing a big ol’ hearing aid, right? Actually, wrong. These days, hearing devices are often super discreet, so chances are you’d never notice if someone is wearing one. 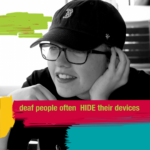 Plus, some deaf people actively hide their devices because they don’t want to be treated differently. Of course this is a reminder not to be judgmental – but you don’t need to gush with sympathy either. Just remember that you never know when you may be talking to a deaf person… so the best thing you can do is take the time and care to be clear with everyone! And if you do notice a hearing device, take care to make that person feel part of the conversation. 7: There’s such a thing as a ‘deaf person nod’. You know when you’re talking to someone, and they’re nodding along like they totally get you, so you assume they totally do? Well, guess what: you may be talking to a deaf person who has absolutely no clue what you’re on about. The ‘deaf person nod’ is a common habit deaf people slip into – usually when they aren’t comfortable asking for clarification. It’s understandable really – no one wants to feel like the annoying person who’s constantly asking others to repeat themselves. So what do you do if someone gives you the deaf nod? Pretending doesn’t do anyone any favours (and won’t help you make friends), so it’s worth pausing to ask if they understand you OK. Check out our other blogs which highlight other challenges for deaf and hard of hearing teens. 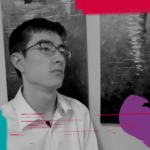 Teenage Deafness and Mental Health – How Are You Doing?